Don't know how to tie a tie? Don't know which tie knot suits you and your outfits? Don't know how to take care of your necktie properly? Don't know how to choose and buy a good necktie? Go through this website and you will find the answer to these questions. 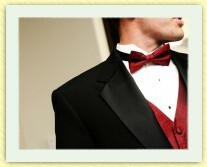 We will provide you detail instructions on tying a tie. Today, four necktie knots are in widespread use. They are the four-in-hand knot, the half-Windsor knot, the Windsor knot and the Pratt knot. The first three are classic necktie knots that have been used for a long time. The Pratt knot is a more recent necktie knot that was introduced to the public in 1989. Below shows a comparison table of the four necktie knots, together with the bow tie. It helps you find the answer to the first question that may come up in your mind -- Which necktie knots do I need? Click the links on the left to see the instructions on tying a certain knot. It is the easiest to learn among the four most commonly used necktie knots. It is asymmetric, which does not look good on wide collar shirts. It is a small tie knot that suits shirts with a narrow collar opening. It gives a sense of nobility. It is a large necktie knot that looks elegant on wide collar shirts. If you use a tie made of thick materials, the resulting knot will be too large. It is not suitable for narrow collar shirts. It suits shirts with a wide collar opening. It looks fabulous in business and political occasions. It is a symmetric necktie knot with an average size (sits between the four-in-hand knot and the half-Windsor knot). It does not look too wide or too narrow. The back of the narrow end of the necktie faces up, which does not look good if it is not well hidden behind the wide end. It is suitable for most shirts and occasions. It gives a superior appearance. It is more difficult to tie a bow tie than a long necktie. More practices are needed to get a proper shape. It is suitable for formal or high-class occasions such as weddings, balls, etc. Knowing how to tie the four most commonly used tie knots and a bow tie is more than enough for most situations. But if you are curious about other ways to tie a tie that are less commonly used, you may want to continue to the next section. Thomas Fink and Yong Mao, who are physicists at the University of Cambridge, published an interesting book titled "The 85 Ways To Tie a Tie. The Science and Aesthetics of Tie Knots" in 1999. If you want to learn the details about different tie knots, this is one of the books that you should buy. Thomas Fink and Yong Mao used mathematical theory and model to prove that there are totally eighty-five ways to tie a tie. Among the eighty-five ways to tie a tie, they found that there are thirteen aesthetic tie knots (including the four-in-hand knot, the half-Windsor knot and the Windsor knot that are described earlier) based on criteria like symmetry and balance. The thirteen aesthetic tie knots are listed below in ascending order of size. Click the links to see the instructions on tying a certain tie knot.